All Regions. PAL and NTSC. 83 Minutes. Thirty six of the best up and coming Taekwon-Do exponents from all over New Zealand got the opportunity to experience a very special training camp! They were selected by their instructors to attend the 2nd ITFNZ Development Camp on 5th - 7th March 2004. This DVD shows the highlights of the camp. 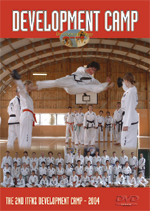 This DVD includes extensive footage of Mr Pellow's self defence class and Mr Patterson's power breaking tips, so serves as an excellent teaching aid. Note: Some DVD players may not play DVD+R format. Paul M TKD does not take responsibility for the DVD not playing on some machines.